Backed dangerously between multiple deadlines, some of which are knitting related, stress has begun to play its tricky little games on my well being. The moment I felt knitting becoming an obligatory task this week, and no longer my stress-free haven, I knew something had to be done. Heedless of the limited number of hours remaining in the weekend, I dropped the complicated sweater project, brewed some coffee and scoured the stash in hopes of getting a yarn hit that would ease my mind. Turning to an old standby I grabbed two skeins of sock yarn, printed a certain free pattern (that I've had on the brain for a few weeks) and zoned out for a couple of hours in simpleton-knitter's bliss. Modifications: None really, other than omitting the ears (although I was tempted) and the crocheted Totoro face. Do you recognize the yarn? I used some of my leftover yarn from the Chimney Socks. In a sad attempt to look like handspun, I held together one strand of solid and one strand of hand-dyed. It looks nothing like the beautiful handspun creations over at Hello, but I'm pretty happy with the result. 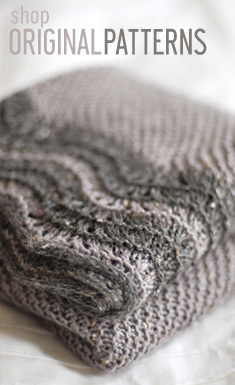 This is a wonderful little project and a smart pattern. I loved it, and not coincidentally because it is so Zimmermann-esque. Adrian knows where it's at. Worked top-down, it's basically like working a larger version of a top-down toe. 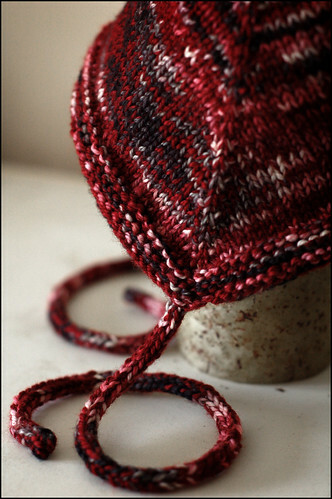 Do you have any leftover sock yarn? 'Cause this one comes highly recommended. Very nice! I have that pattern printed out for some such future emergency myself, and the Chimney yarn is a great choice. So sweet and cozy! Might have to adapt it for a grown-up head! Very sweet! I think I'll need to make that lovely thing for the next baby who comes along. I think the yarn choice is lovely, too - the ultimate recipient will enjoy having a baby item that isn't the standard issue pink, blue, or gender-neutral pastel. It is always so nice to read your well written blog. 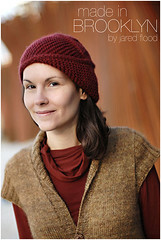 The hat is sooo cute - sounds like the perfect no-stress project! !!!!!! I love it! And I *do* happen to have some leftover sock yarn, and it even happens to be in some sort of "babyish" colors. Thanks for pointing us to the pattern! Yours looks so lovely. Ooh, good find! That is a very cute hat. This turned out adorable, I love the colors. I have some Koigu that would make a sweet little one! Nice use of yarn and uplifting of the spirit! And it really does resemble a toe-down toe. Which I wouldn't normally consider putting on a person's head, but it's very cute! I'll have to remember this pattern for my leftover sock yarns. What an adorable bonnet. I have a couple of friends having babies - so this is perfect! Great colour choice...so appropriate for this month's heart-themed holiday, wouldn't you agree? Far nicer not to be knitting to a deadline, and that's a clever little bonnet. I may need to adapt that to something for Dulaan, since I have no impending babies to knit for. It's beautiful in that yarn! I laughed out loud at the little red love heart. You make me feel all fancy. That is a beautiful hat. I shall have to add it to my pile of "patterns I like and may want to make someday!" Do I have leftover sock yarn? And how! De-lurking to say this is a great version of this bonnet. And your blog, as I'm sure you've been told countless times, is stunningly beautiful. Damn that's cool ... i'm currently weighted up with projects ... and putting pressure on myself to get through them ... good to remind oneself to actually relax and enjoy the process. Admitedly I think I am MOSTLY a simpleton-knitter, unlike yourself! cute little bonnet. 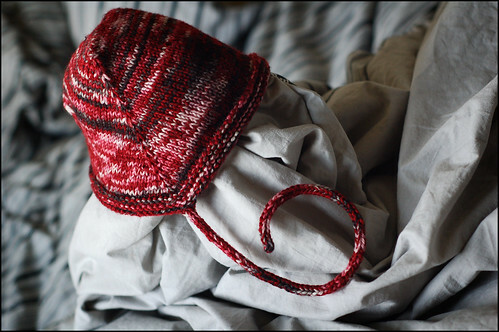 not totally unalike the ganomy hat that can be adapted into a baby size, which i did myself. your blog is lovely. finished the seamless hybrid today that was the whole reason for my zimmermann itch, as far as i remember. and due to that we may have a zimmermann craze here in denmark pretty soon. i know a few good looking men to make seamless hybrids for. that is certain. Have you posted it on the Hello Yarn flikr group yet? I did this bonnet last year and was quite please..eventually. Must say, doing it in the sock yarn is kewl. The bonnet is adorable! Dare I say, even a bit tweed like? The hat looks great with the two colors combined together. Very nice job, and I hope it alleviated some of the stress. Another lurker here, delurking to say hi and how I love this chic little bonnet!! Very clever work! And the shots are strikingly beautiful as usual. lovely, lovely, lovely. and very appropriate for valentines. Oh I do like that one, beautiful! Happy V day, and cute bonnet! The bonnet is so sweet. 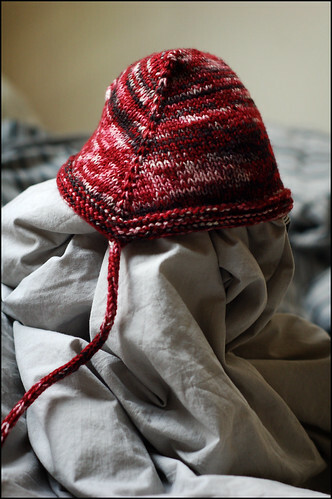 Of course, you can't go wrong with Sundara Yarn. That is so cute! I love the colors and that great side detail! Love the bonnet, it looks great! Adrian has a knack for writing the best simple patterns that look awesome! And the colors are sweet too. Very cute baby bonnet! I think that both yarns look wonderful together! i wish my head was that small. LOVE the yarn. and i'm sure that your photographic skill enhances any object you shoot. Nice version of Toturo! Exactly what I thought, like making a giant toe-up sock! You made a great pattern your own in fabulous color. Verrrry bonny bonnet dair. =) Be it for a verry bonny wee head? Oh, that is gorgeous! It does indeed look like a big sock toe, or even a nose warmer. I think my children need one each! Every time I've opened your blog this week I keep thinking you're talking to me - I keep thinking it says "Hello Bennett"!! !